The new manga series, We Never Learn Vol.1, doesn’t revolve around crushes or unrequited love like most high school harem manga. It revolves around Nariyuki Yuiga. He is a jack of all trades and the master of none, spending all his time on his studies. His goal is to get the special VIP recommendation to go to University on a full scholarship. He is the brain of the school but, there are two girls known as geniuses that stand in his way. Rizu Ogata is known as the Clockwork Thumbelina. She is small and is a genius in math and science. She is able to do complex equations in her head. The other genius is Fumino Furuhashi. Her nickname is Sleeping beauty. She tends to fall asleep in class and is known for her beauty and literary prowess. Naruyuki knows of these girls because he sits next to them in the classes they do best at. He doesn’t particularly like them because he has worked very hard to become the best. Finally, the day comes where the principle says that Naruyuki will get the VIP recommendation. On one condition of course. 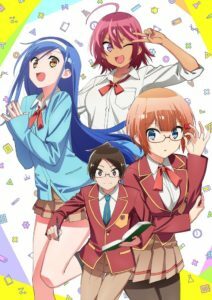 He must tutor Rizu Ogata and Fumino Furuhashi. He has no choice but to say yes. At first, Yuiga doesn’t understand why he must help the girls. Soon, he learns that they each want to go to university for the subject that they are the worst in. Ogata wants to go to a liberal art university and study psychology but, she doesn’t understand human emotions and thinking because it can’t be explained with science or math. Furuhashi on the other hand wants to go to university for science and study the stars. The problem for her though is that she sees constellations as equations and makes her mind go blank. We Never Learn vol. 1 isn’t so cut and dry. When everything seems to be going swimmingly, another student needs to be tutored. Uruka Takemoto, Yuiga’s classmate since middle school. She as known as the best swimmer, never losing a race. In order for her to go to university for swimming she must pass an english exam. Unlike the other girls Takemoto can’t sit still and studying is even harder. The principle adds Takemoto to his tutoring group. Creating even more work for the poor guy. There is a bit of blushing and nervousness from the characters. But, all innocent and a proper response in each of the circumstances. Just lots of wholesome friendship development. Which is a breath of fresh air. To have the characters evolve and get to know each other as people is wonderful. The main protagonist states from the beginning that he isn’t interested in dating at the moment and he stays that way. He doesn’t just change his mind when pretty girls give him attention. Ogata and Furuhashi were good friends before the tutoring and remain throughout We Never Learn vol. 1. They are given backstories that makes their even more relevant. You can see how each of their pasts have developed who they are in We Never Learn Vol.1 . It’s not the stereotypical harem manga with the stereotypes and backstories that are all the same. Takemoto’s story isn’t as clear as the other girls yet. She is introduced at towards the end of the manga. But, her active fun attitude is a good addition. It suits her sport and the narrative. The art in We Never Learn vol. 1 is good. Its super clean and pretty standard for a manga. There isn’t any huge spreads or actions scenes to be shown. You always know what is going on and feel like you are part of the fun. Personally I think it goes well with the story. Any over the top art wouldn’t go well with the cutesy school feel of it. I am personally looking forward to future releases of this manga in English. So far 78 chapters have been released in Japan. The anime is also in the works. Scheduled to release April 2019. I hope there is more good things to come. If they are anything like this first book I will be happy read and watch!